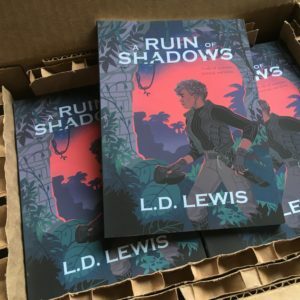 A Ruin of Shadows now available for pre-order! A Ruin of Shadows, which has a release date of April 24th, is now available for pre-order! I have boxes and boxes of this book, in my house and in my car, and I can’t even express how excited and pleased I am by how this has all turned out. It is a beautiful little book and a captivating story. Every time I read it (and I had to read it more than a few times, between editing and typesetting, etc.) I was delighted to be swept up in it again. In the weeks between now and April 24th, expect more teasers on this book, from the story to the author, L.D. Lewis, who I have so enjoyed working with through this process, and a bit on the amazing artist who created our cover image as well. As of now, pre-orders are available on this website only. If you want to be notified when it becomes available through other venues, please follow us on social media, or sign up for our newsletter below! And if there is somewhere in particular you’d like to see this book, let us know in the comments, and I’ll do my best to make it happen!